For those of us who want to throw on a mask on be left smelling like a face of fresh rose petals and clear, hydrated skin, Fresh’s Rose Face Mask uses real rose petals in a silky gel cream to hydrate and tone the skin. This leaves you feeling incredibly soft, nourished, and refreshed. Safe for all skin (including sensitive and acne-prone), the bestselling mask is designed to help minimize pore size and hydrate dry skin types. But it works for any skin type, and actually helps in restoring balance for those who are oily or combination. When applying the mask, skin feels instantly refreshed, and after a long day or week of work, isn’t that what we are all looking for? Considering the organic ingredients, scent, and entire experience, I would actually rate this mask a step further- it’s more like an at-home spa experience, but one you can enjoy as often as you’d like without totally breaking the bank. So what’s all the hype about Fresh’s Rose Face Mask? We reviewed. Fresh Cosmetics Rose Face Mask, designed to treat signs of dryness, aging skin, and large pore size, is a fan favorite for the brand, and feels like you’re using a spa treatment from the comfort of your own home. Formulated with fresh organic ingredients and nothing artificial, it supports skin healths and leaves you with a fresh and radiant glow. After using the mask, my skin instantly improved even after one use (in terms of tone, texture, clarity, hydration and a general feeling of nourishment/calming). Even with sensitive and acne-prone skin and poor reactions to rose ingredients in the past, I experienced no irritation or breakouts after using the Rose Mask. It also smells exactly like fresh flowers and rose petals, probably because it actually contains fresh rose petals. Talk about true luxury in a jar. After using this mask at night, I woke up to truly dewy and radiant skin, and I could tell that the appearance of my pore size had definitely decreased. While the Fresh Rose Face Mask is great for hydrating dry skin, it also works great at restoring balance for those who are oily or combination and has great benefits as an anti-acne treatment as well. For those who are sensitive, it is extremely gentle and nourishing, and very calming- whether it’s applied during the day or night. It seems like a great treatment for those of all age groups as well, as it has preventative benefits and anti-aging benefits, if you’re looking to treat lines, wrinkles, and sun damage. We took a look at some of the main benefits to using Fresh’s Rose Face Mask by studying some of the key ingredients contained in the formulation. This is definitely the first skincare product I’ve seen that contains actual rose petals as an ingredient, and I am not upset by that. 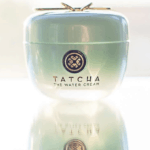 The ingredients help hydrate, nourish, balance, tone, and anti-age the skin. In addition, there are some anti-acne benefits with use, and the skin works for minimizing the look of large pores. 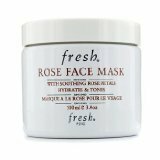 Fresh Rose Face Mask: How Do I Use It? If you have very sensitive skin (or price barriers are a concern given this item for you) or have not used Fresh Cosmetics products in the past, the return and exchange policy in this case may be a highly important factor for you. The manufacturer, Fresh Cosmetics, has a strong return and exchange policy that honors full refunds upon dissatisfaction or allergy, and this policy favors the consumer, both new and returning. If you are dissatisfied with the use of Fresh Cosmetic’s Rose Face Mask, or if it does not work for your skin to provide suitable skincare and hydrating benefits, or you experience any product allergy or reaction to the formulation, you may elect to return it at any time. In this case, the formulation of the Rose Face Mask was gentle enough to use even with very sensitive and acne-prone skin (I was actually quite surprised to find this out myself with a history of rose sensitivity) and did not cause any irritation or breakouts, but due to any personal sensitivity concerns this policy may help assuage fears, as individual allergies are always different. Fresh Rose Face Mask: Worth It Winner? While Fresh’s Rose Face Mask may definitely be a splurge, there is no denying the benefits with use and that this is one of the most luxurious at-home spa like treatments I have tried in any product range for the skin. It is anti-aging, and completely restores skin texture and tone, and fully brightens the complexion for those with dull or sallow skin tones. When applied to the face, it feels quite luxurious and instantly calms, smoothes, and tones. It is also safe for all to use (excluding those with specific allergies), and made my face feel instantly smoother and more appear more vibrant. In terms of the overall mask category, price considered, we’d give this a 4.5/5. In terms of overall quality if price was not as steep, this would easily rank in at a 5/5, and is definitely a splurge I would recommend everyone try out at least once for a renewed and fully restored appearance.